According to our statistics, 45% of Navixy partners around the world provide smart solutions which allow their customers to control mobile employees: merchandisers, sales representatives, couriers, etc. Therefore, we place greater focus on the Tasks app and our developers constantly polish it up. This time, the changes are fundamental: advanced, more intuitive UI/UX design. Create, assign and manage tasks in a new way. Make less clicks, manage only necessary elements on the screen, and experience the cutting edge interface. Read the article to learn about all the Tasks app novelties and try the beta version. The interface has become more ergonomic and intuitive. With one button your customers can create a task or import a list of existing tasks in XLS or TXT files. Create single and route tasks. New interface allows your customers to create single or route tasks at the same window. In case your customer, e.g. an e-store, decided to create a route task with several destinations, its operator simply needs to create additional checkpoints, specify the address and delivery time. For companies that require Proof of Delivery (POD), a task can be supplemented with a mobile form. Drag and drop checkpoints to change the route. For example, an employee would not be able to visit the customer in the morning, because the plans had been changed for whatever reason. In this case, the operator can easily move the checkpoint to the end of the list and reschedule the visit for the evening. After the order of checkpoints has been changed, the software will warn the operator if the employee does not have time for a visit. The field will be tagged with the exclamation mark . Hmm, it means you’d better change the time to put the schedule back in order. The list of created assignments can be customized. Let your customers tick the information they want to browse on the screen and hide the rest they do not need. Edit tasks while browsing the list. Your customers can browse all the detailed info for each task on a single screen. They need to pick one and proceed with the task info panel. 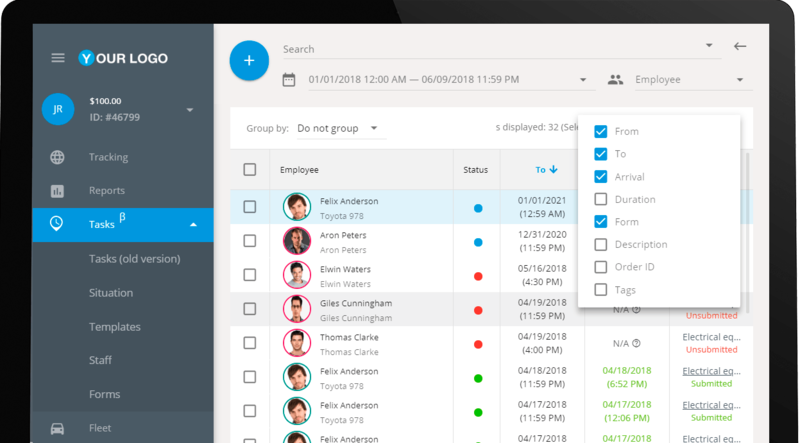 Moreover, the tasks can be edited straight away: reassign employees, change the date, edit the description, add a new form, etc. This way, your customers save time making less clicks and do not get confused switching between several windows. The Tasks app transformation is in progress. The developers’ checklist has a whole lot more plans, ideas and requests from our partners, which are being gradually implemented. And the Attachments feature is also in the line. In the meantime, let’s briefly summarize what has been already done. The best UI and UX practices have been implemented to make the “picture” and user experience more comprehensive and visually pleasing. Task info panel added. Browse and edit the information for each task in the list. The Beta version is already available. Your feedback is very important to us. If you have any questions, suggestions or want to test the app, please contact our specialists: [email protected].